Week 4 Progress - let the layering begin! First up, the most important piece and jumping off point for this entire design ... my Putnam rolling library ladder found on Kijiji. 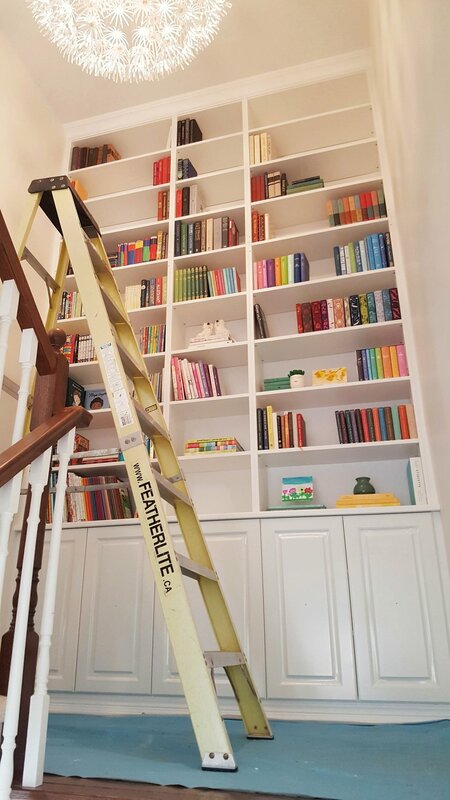 Knowing that one day our "dream home" family room would have high ceilings and library with a rolling ladder or two, I started hunting for a library ladder about two years ago. Last summer I hit the jackpot! 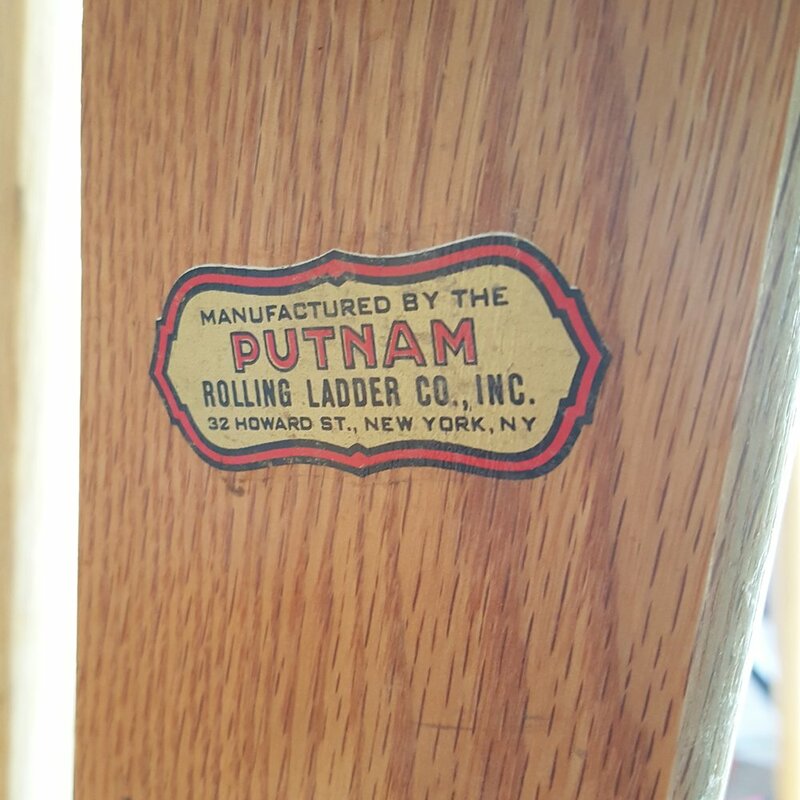 I found two vintage rolling library ladders including the rails that had been removed from a shoe store in downtown Toronto for $180 - for the pair! kijiji find rolling library ladders with rails - $180 for the pair! For this design we chose to work with the one in the worst condition because of the black hardware which would match the iron rail and offset the brass light fixture and vintage cabinet hardware in the design. My brother/contractor Paul from Brancon and I spent a Saturday afternoon sanding down the damaged finish to reveal beautiful red oak. With dark oak hardwood in our home I wanted a medium tone finish that would compliment it but not perfectly match it. 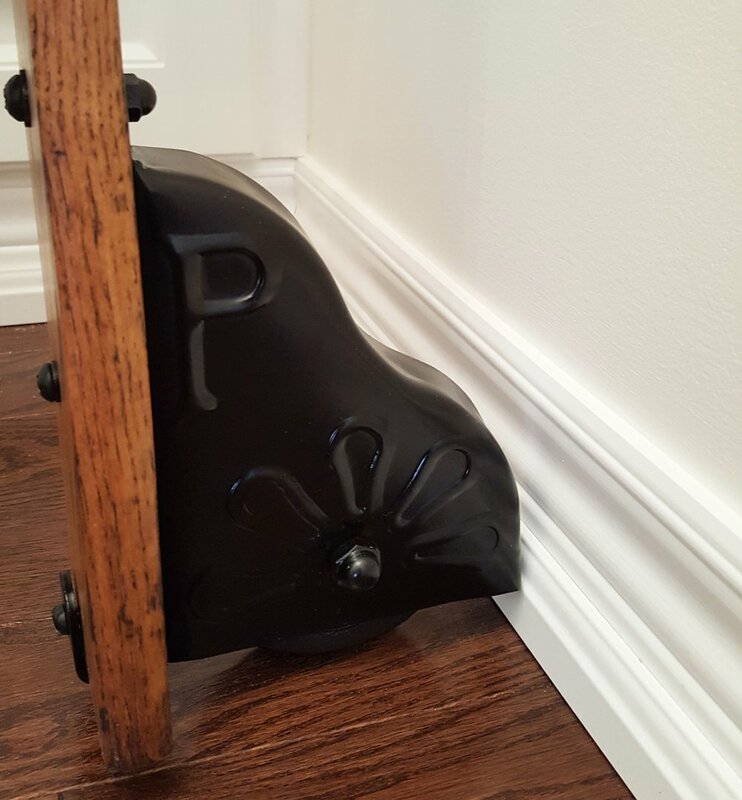 After a few tests with stain Paul already had, Minwax's "Walnut" was the perfect fit. He also sanded all of the rusted iron hardware including the rails and sprayed it with a semi-gloss black from Rustoleum. 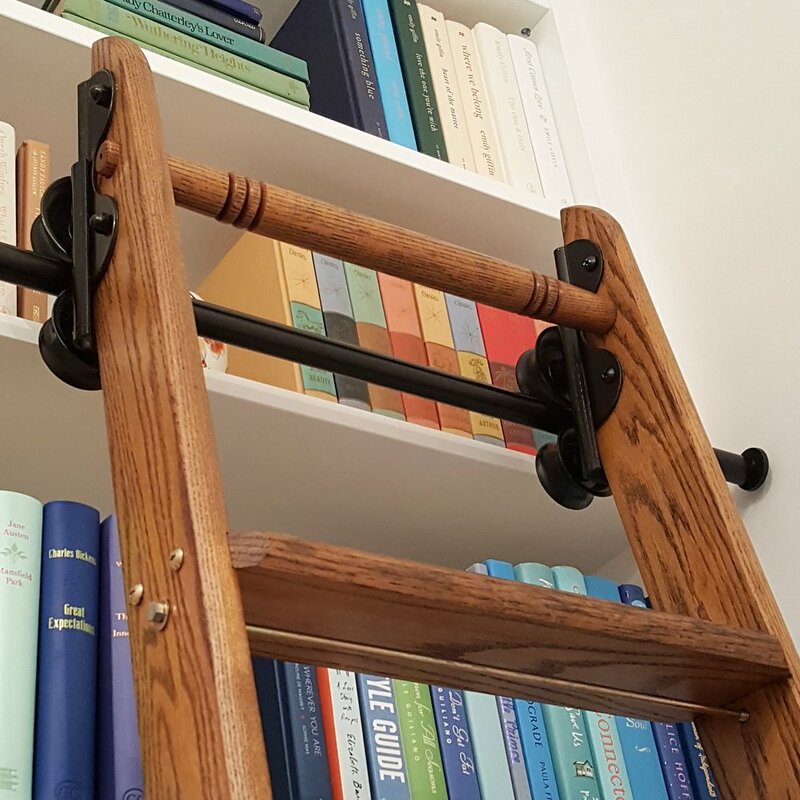 I purchased 4 brackets (and 2 end caps) to secure the rail in place on the bookshelf straight from the Putnam Rolling Ladder Company in New York - everything else was purchased second hand which really stretched my budget. The final product is nothing short of spectacular and this old rusted ladder now looks as good as new! Another redesigned find that I'm really excited about is this antique English bench. Like the ladder, I also found it on Kijiji in rough condition but I absolutely loved the colour of the wood, the shape of the legs and the detail in the carving. I found a remnant of Kelly Wearstler's "Channels" fabric in periwinkle blue on Ebay early last year. I was originally thinking pillows but hesitated and I'm happy that I did. It came back from being reupholstered this week and looks beautiful. And bonus - I still have enough fabric left for pillows! There is still quite a bit more to do before we reach the finish line for the challenge but the hardest part is behind us thanks to my brother Paul. This week I need to finish printing and framing some art for the gallery walls throughout the stairway - one piece in in good hands at The Shadow Box in Orillia already. Then last but not least my favourite part - styling the stairway and all other spaces within sight lines (including bedrooms). Stay tuned for a focus on art next week and the final reveal on May 10th. Please also take a peek at the amazing work featured designers and fellow guest participants are doing with their One Room Challenges.